There is a lot going on here on Kitchen Concoctions this week! I started the week with a big giveaway for T-fal Stainless Steel with Thermo-spot 12-Piece Cookware Set. I shared when I announced the giveaway that I was super impressed with this set of cookware and that I was excited for one of you to win a set. These pots and pans really did wow me! Unfortunately I have an electric stove. With my old pots and pans it took for.ev.er for them to heat up or boil water. This cookware not only has stainless steel induction, it has Thermo-spot technology that indicates when your pan is hot and ready to cook. Even with electric burners these pots got hot fast and had entire pots of water boiling in mere minutes. Another great feature is that these pans have interior measuring marks, are metal utensil, dishwasher and oven safe. Score! If you want to win a set of your own T-fal Stainless Steel with Thermo-spot 12-Piece Cookware click here to enter on Kitchen Concoctions or check out 49 other bloggers who are also hosting the Cooking Planit/T-fal giveaway! 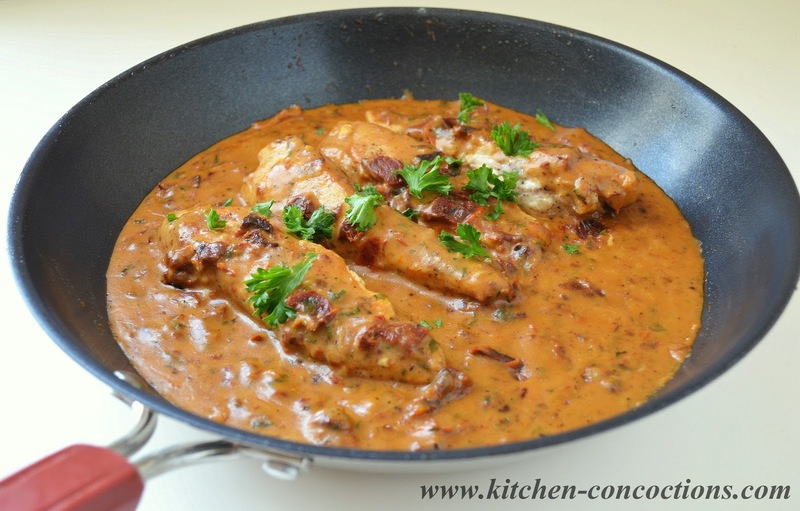 The first thing I cooked up were these Chicken Tenders with Creamy Sun-Dried Tomato Sauce. We absolutely loved this dish and it will defiantly going in rotation! It was a nice change to our normal chicken dishes. 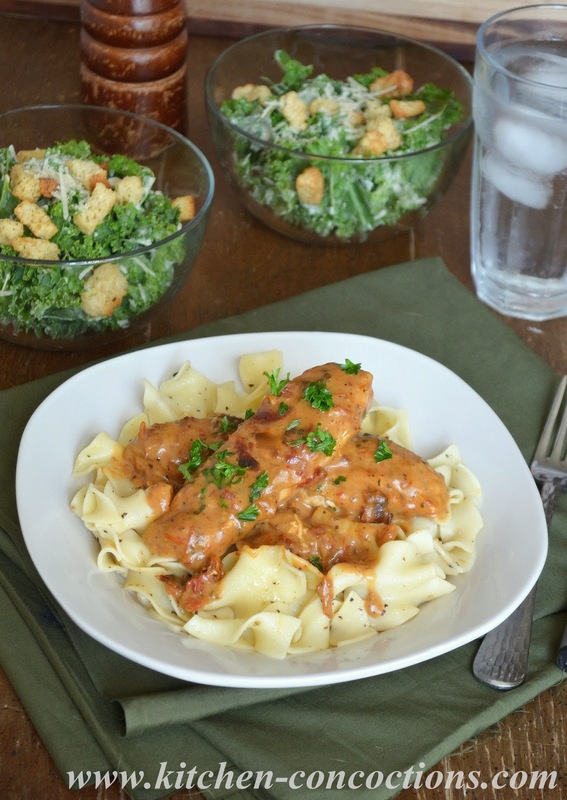 We loved the burst of flavor and unique texture the sun-dried tomatoes added to this dish. 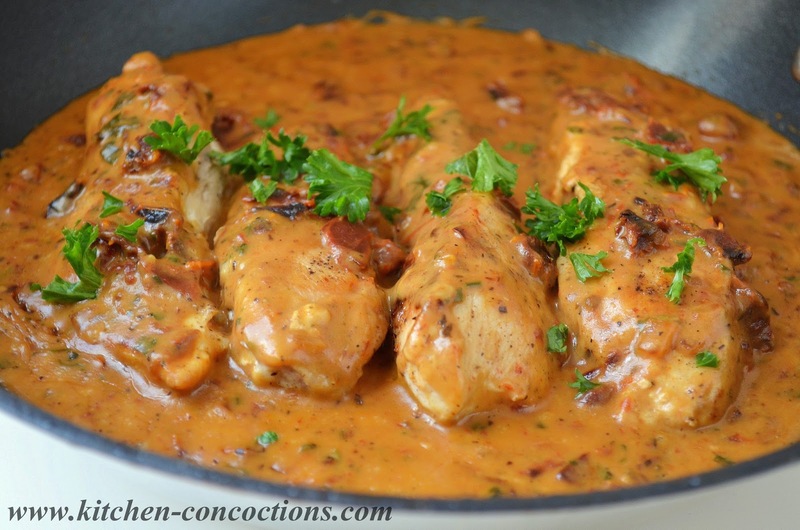 The sauce was nice and creamy and the best part is most of these ingredients are things I always have on hand. Served with some buttered egg noodles and a Kale Ceaser Salad (recipe coming soon!) all made in under an hour, this is a great week night meal! Season chicken with salt and pepper. Line a plate with paper towels. Set plate near the stove for the chicken. Heat a large saute pan over medium-high heat. Add olive oil and warm. Once oil is hot, add the chicken strips being careful not to over crowd the pan, working in batches if needed. Cook chicken 4-5 minutes per side. Transfer to the plate lined with paper towels. Repeat with remaining chicken, if needed. Place the pan back over medium heat. Add more oil, if needed. Once oil is warm, add the onions and saute until softened and starting to caramelize, cooking for about 2-3 minutes. Add in the garlic and sun-dried tomatoes. Cook until the sun-dried tomatoes are well softened and mixture is fragrant, about 2-3 minutes. Stir in the flour and cook for 1-2 minutes, stirring continuously. Whisk in the milk and Parmesan cheese. Stir until mixture is smooth and thickened, about 2-3 minutes. Once mixture is thickened, stir in the parsley and season with salt and pepper to taste. Add the chicken back to the pan and toss to coat in sauce. Remove from heat. 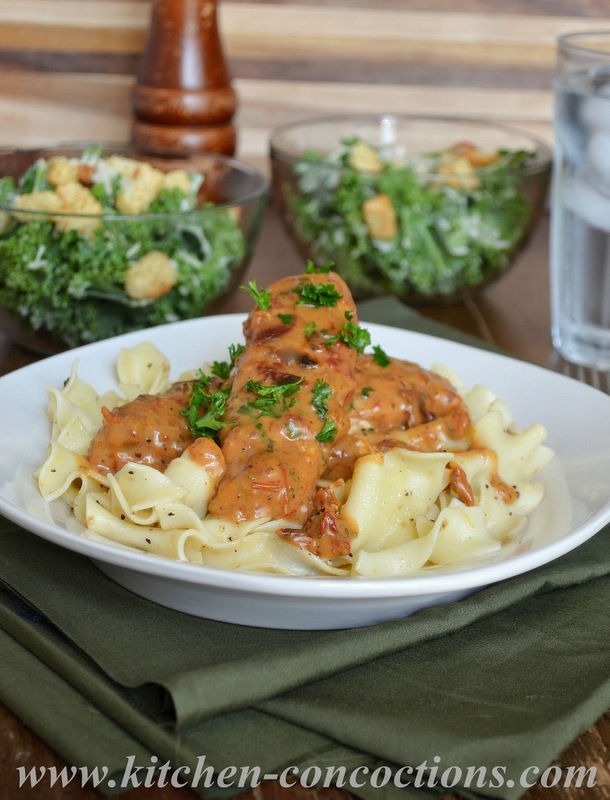 Serve chicken and creamy sun-dried tomato sauce topped with additional parsley or Parmesan cheese if desired. Disclosure: The giveaway is sponsored by Cooking Planit and T-Fal. I was provided a cookware set for participation as well as one to giveaway. Cooking Planit also sponsored this dinner. All thoughts and opinions are my own.